Its major export partners are Norway, Germany, and the United States. Its main exports are machinery, motor vehicles, paper products, pulp, and wood. Its major import partners are Germany, the Netherlands, and Norway. Its major imports include machinery, petroleum and petroleum products, and chemicals. Located in Northern Europe, Sweden has a 2,211.00 km border with Finland (545 km) and Norway (1,666 km). It has a 3,218.00 km coastline. Sweden’s capital city, Stockholm, is spread out over fourteen islands as well as the areas of Södermanland and Uppland. The city’s metro area includes twenty six municipalities while the population of the city itself is estimated to be 942,370 with a density of 13,000 per square mile. Along with being home to Parliament House, the city also features an array of historic sites and cultural institutions such as Tessin Palace, Riddarholm Church, Bonde Palace, and Vasa Museum. Because of Stockholm’s oceanic climate average temperatures are mild across all seasons. Sweden is a European country covering 450,295.00 km2 of which 8.87% is water and 410,335.00 km2 is land. This makes it the 55th largest country in the world and almost three times the size of Georgia slightly larger than California. Its geographic coordinates are 62 00 N, 15 00 E and Stockholm is the capital city. The name derives itself from the North Germanic Svear tribe. Its ISO code is SE. Sweden has a mean elevation of 320 m above sea level. It has a temperate climate that varies greatly with altitude, from cold and cloudy and humid summers. Its terrain is mostly flat with gentle rolling lowlands, and mountains in the west. Sweden has a population of 9,880,604 making it the 89th largest in the world. The majority of the population lives in the southern region. Swedish is the official language. The major ethnic groups are described as Swedes, Finnish, and Sami minorities. A large percentage of the population belongs to the Church of Sweden. Swedish is the official national language of Sweden and is spoken by the majority of Swedish citizens. Linguistically, Swedish is very similar to Danish and Norwegian. The alphabet is made up of twenty nine letters with three added during the 16th century. Sweden is home to six local dialects which are spread out over the entire geographical area of the large northern European country. 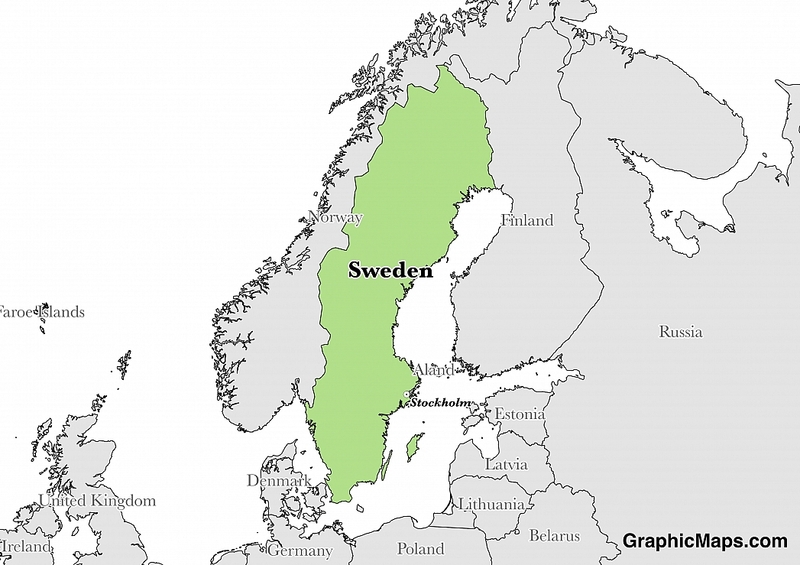 Swedish officially gained the status of official national language in 2009 following the adoption of a new language law. Common useful phrases include, “Välkommen” for “welcome” and “Hej” or “Hallå” for a casual “hello”. Traditional minority languages include Finnish, Sami, Romani, Meänkieli, and Yiddish. The dialing code for the country is 46. Sweden is an independent country. It gained independence in 1523. Its constitution was last ratified in 1974. Officially, The Kingdom of Sweden is a constitutional monarchy. Its legislative governing body is known as the Riksdag which is made up of 349 members who conduct the business of the nation in a building called the Parliament House. Members of the Riksdag serve four year terms with elections taking place every fourth year on the second Sunday in September. Factoring in Purchasing Power Parity, Sweden's GDP is $498,000,000,000.00 (USD) with $49,700.00 (USD) per capita. This makes it the 38th largest economy and its citizens the 25th richest in the world. The currency of Sweden is the Krona (SEK). Its major export partners are Norway, Germany, and the United States. Its main exports are machinery, motor vehicles, paper products, pulp, and wood. Its major import partners are Germany, the Netherlands, and Norway. Its major imports include machinery, petroleum and petroleum products, and chemicals. The history, traditions, and national identity of the Nordic country of Sweden are all reflected in its flag. The yellow and blue colors which make up the flag symbolize generosity, loyalty, justice, and truth. The cross reflects the Christian history and beliefs of the Swedish people. The official flag was also heavily influenced by the many monarchs who ruled the country over its lengthy history. The most notable of whom, at least in regards to the inspiration behind the flag’s design, was King Eric IX who is said to have had a vision of a cross in the sky during 1157’s First Swedish Crusade. Officially adopted in 1906, the modern Swedish flag features elements inspired by the neighboring Scandinavian nation of Denmark.